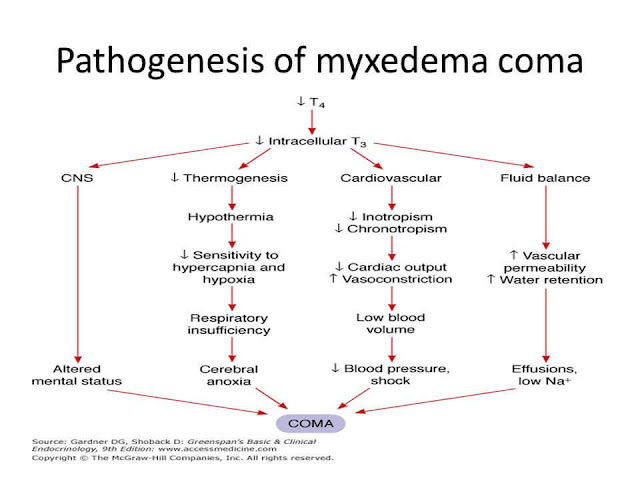 Definition: The term myxedema coma is a misnomer, as myxedema and coma are neither diagnostic criteria nor common presenting findings. A more proper description would be critical hypothyroidism. Infections, especially pneumonia, are perhaps the most common precipitating factor. Cardiac events (myocardial infarction, congestive heart failure). Respiratory depression secondary to anesthetics or sedatives. Generalized skin and soft tissue swelling and the presence of cool, dry skin. The degree of TFT abnormalities does not distinguish hypothyroidism from myxedema coma. Rather, the distinction is based on clinical findings. It is important for the clinician to be able to differentiate hypothyroidism from euthyroid sick syndrome, in which patients have a reduction in both TSH and thyroid hormone levels. High-dose intravenous thyroxine is given as a bolus of 300-500 mcg, followed by 50-100 mcg daily depending on the patient's age, weight, and risk of complications. This method provides a more rapid recovery of symptoms but carries the potential for unwanted cardiac events resulting from the rapid replacement of thyroxine. Regardless of the replacement method used, all patients should be continuously monitored for hypertension and cardiac ischemia. Supportive care should be provided while thyroid hormone levels are replaced. Ventilatory support, passive external rewarming, and correction of underlying electrolyte abnormalities are commonly required.